Grevena (Greek: Γρεβενά, Grevená, [ɣreveˈna], Aromanian: Grebini) is a town and municipality in Western Macedonia, Northern Greece, capital of the Grevena regional unit. The town's current population is 13,374 citizens (2011). It lies about 400 kilometres (249 miles) from Athens and about 180 km (112 miles) from Thessaloniki. The municipality's population is 25,905. 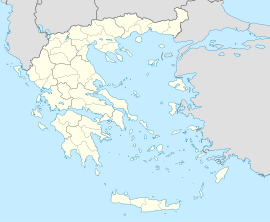 Grevena has had access to the Egnatia Odos since the early 2000s, which now connects Igoumenitsa with Thessaloniki and Alexandroupoli at the border with Turkey. Mountains surround the municipality, which is situated by the river Greveniotikos, which itself flows into the Aliakmon. Other significant towns in the municipality are Amygdaliés and Méga Seiríni. Grevena Municipal Museum is located in the town. Under Ottoman rule, Grevena (Ottoman name Gerebena) was the seat of the kaza of Grevena, Sanjak of Serfice, Manastir Vilayet. The earthquake that occurred in the region on 13 May 1995 was 6.6 on the Richter magnitude scale, but it caused only material damage. The worst hit area was the county of Ventzia. There were two foreshocks of lesser intensity that preceded the main earthquake by a few minutes and warned people. These warnings sent the population out of their houses. When the main earthquake came, it destroyed nearly all the houses in several villages of the Ventzia County – the houses collapsed to the ground – but all the inhabitants were outside. Another earthquake on 5 January 2005 measured 4.9 near Grevena. It took place at 20:00 local time (EET), and no damage was reported. Another earthquake with a measured intensity of 5.4 occurred on 17 July 2007 at 21:23 local time (EET) and was followed by weak aftershocks. Some older buildings were lightly damaged in villages northeast of Grevena. The aforementioned population figures are as of 2011[update]. In the area, there is large production of mushrooms, collected in the Valia Calda area.